And when the day of Pentecost arrived, they were all together in the same place (Acts 2:1). Luke doesn’t clarify exactly where this “place” is, but it makes sense that they would have gathered in the “upper room” of Acts 1:13, the same upper room that hosted the last supper. If the house’s owner willingly offered it to Jesus for the Passover meal, he very well could have continued lending the space to Jesus’s followers after the crucifixion. 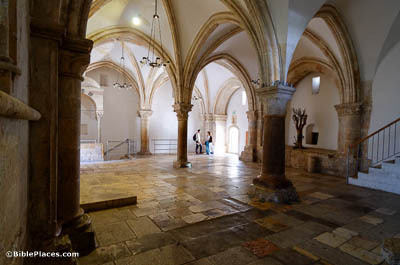 This building, set on Mount Zion, is the upper room’s traditional location—though the structure itself is Crusader. About the patriarch David . . . he both died and was buried, and his tomb is with us to this day (Acts 2:29). 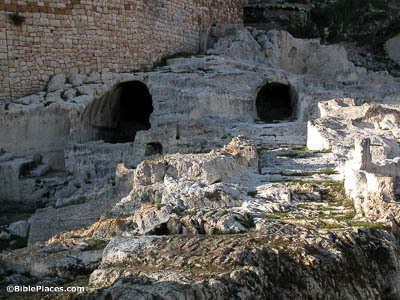 It seems that the location of David’s tomb was known to Peter’s first-century audience. Since then, however, the spot has become unclear. The traditional location on Mount Zion is one option, though a problematic one. These cave-like structures, found at the southeastern edge of the City of David, are another option. While they lack the normal markers of Iron Age tombs, they do align more closely with the general location implied in Nehemiah 3. So while most scholars today would reject these caves as a viable option, they may not be far off from where the true tomb lies. And Peter said to them, “Repent and be baptized” (Acts 2:38). Later in the chapter, 3,000 people heed Paul’s exhortation to be baptized. Peter and company would have needed more than one small mikvah to baptize them all. 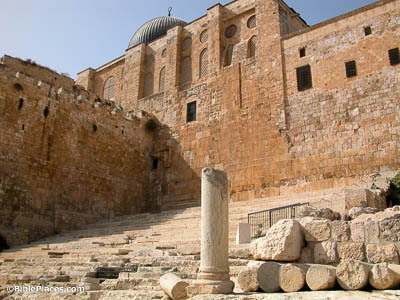 Fortunately, first-century AD Jerusalem was designed to handle the ritual requirements of visiting pilgrims, with many mikvot surrounding the Temple Mount for the convenience of those going up to worship. 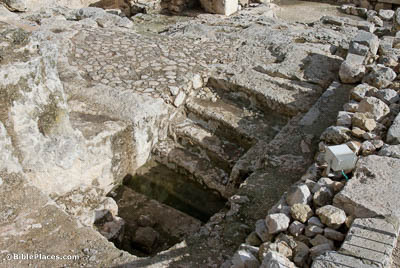 It may have been at these very pools that the early core of the church was baptized. The promise is for you and for your children, and for all who are far away (Acts 2:39). This verse is somewhat ambiguous; some believe that Peter is talking about Gentiles as those “who are far away,” while others hold that he means Jewish communities outside of the Promised Land. Eventually, the gospel would reach both groups. 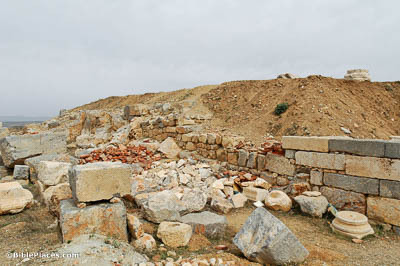 These remains sit over the foundation of a synagogue in Pisidian Antioch, a city in modern Turkey, where Paul brought news of Jesus to Jews and Gentiles alike. Then those who accepted his message were baptized (Acts 2:41). Luke does not tell us where Peter gave his speech, so we can’t be dogmatic about the location. However, the Temple Mount would be the most obvious spot; as perhaps the single largest open space in Jerusalem, it would have been the natural gathering place for a crowd of this size. At the conclusion of his message, Peter and the crowd likely would have come out through this gate, down the southern steps of the Temple Mount, and toward the nearby mikvot in order to perform this mass baptism. There were added to them that day about three thousand souls (Acts 2:41). 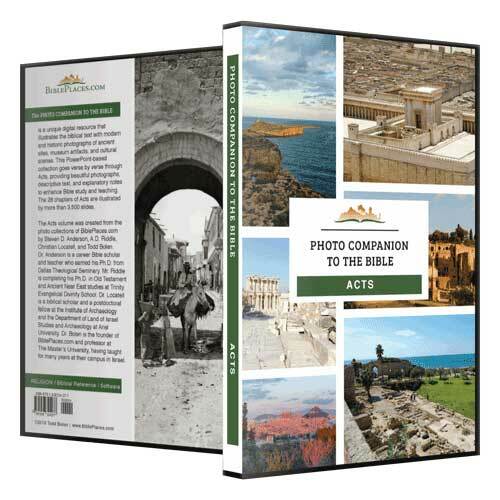 Jerusalem was no stranger to pilgrim crowds in the first century, as evidenced by the Temple Mount’s design, and it continues to host huge groups on a regular basis. 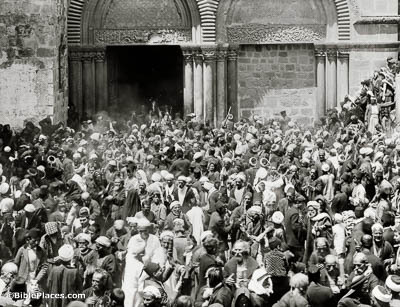 This American Colony photograph, taken between 1900 and 1920, shows one such crowd packed into the Church of the Holy Sepulcher’s courtyard.